Dogs’ paws are tougher than our feet, but they are still much more delicate than the soles of our shoes, so having a paw friendly surface to keep your pooch’s feet comfortable in your garden is a must. Don’t use hard gravel or anything with a rough or spikey edge, as these could cut their pads and even get stuck between their toes. Try not to choose a surface than can get too hot in the sun either, as this will be equally unpleasant for them to walk on. 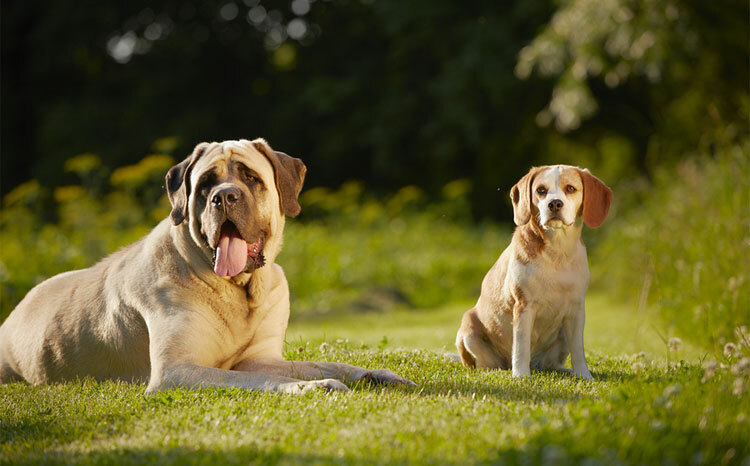 With their thick furry coats, dogs can become very hot in the summer months, especially when the sun is out. They can also work themselves into a sweat just by running round and playing catch, so it important to provide them with a good amount of shade. Make sure they have a cool and shady spot to relax in, either under a tree or an awning, this way they can get their breath back before the next game of Frisbee and keep their body temperature down. Dogs can be great escape artists when they want to be, and there is nothing like chasing a cat or a squirrel to lead them down the wrong path, literally. If your dog runs out of your garden, they could easily get lost or even worse, hit by a car. Farmers are also allowed to shoot dogs if they think they may be upsetting their livestock, so fencing your dog in is very important. Make sure your fence is high enough that they can’t jump over it, but deep enough so they can’t dig underneath it. Believe it or not, there are some plants that can be very poisonous for dogs, so it is important to check if you have any of these in your garden before getting one. Here are just a few of the dangerous plants that can be found in your garden, for the full list check the Kennel Club website. Try and avoid having patches of bare soil in your garden, as unfortunately this is only going to encourage your dog to dig and end up ruining your garden and flowerbeds. Choose dog friendly plants that aren’t too delicate, such as thyme and periwinkle and plant them in between large woody plants, so there aren’t any gaps. If all your plants are close together your dog won’t find a space to dig. If you have an area that will be bare for a while then try sectioning it off using chicken wire. It is important to clearly define which part of the garden your dog is allowed to walk on and which parts are out of bounds. The last thing you want is to find a trail of paw prints across your perfectly preened flowerbeds. Wooden planks and sleepers are perfect for creating borders, they are strong and heavy so won’t budge once in place, and they also look great. These should prevent your dog from walking on areas they aren’t allowed and also give your garden some extra definition.